Rated #1 by the American Culinary Institute! Foods cook three to ten times faster than ordinary cooking methods, even faster than a microwave for many foods. 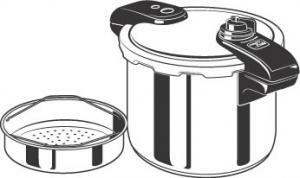 This deluxe pressure cooker is crafted of luxurious stainless steel with a triclad base for quick, even heating and easy cleaning. Chicken, fish, pork, and beef come out tender and delicious. Pressure-steamed vegetables retain their nutrients and colors. Cook great desserts and breads, too! Includes stainless steel steamer basket and complete instruction/recipe book.